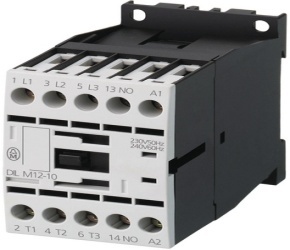 Electronic coil controller allows contactors to reduce power consumption and generate less heat, resulting in lower cooling requirements, the ability to mount more contactors/starters per cabinet, and an extended life on pilot devices that carry control signals. AC and DC devices with the same dimensions achieved with an electronically controlled coil system allow for space savings and reduced engineering design time. Integrated suppressors in DC controlled contactors offers reductions in total logistics and inventory costs by limiting the number of products ordered and stocked. Wiring is not required, therefore increasing installation and maintenance efficiency. Expanded range of DC coil control voltages, allows reliable operation through fluctuations in control voltages.